A smart coworker space management solution for a small organization to large enterprises, dedicatedly workspace rental business venturing is the smartest way to build an online business. In other words, office space rental makes a how you manage the events, people, places and business. An android app simplifies the user requirements and made online booking efficiently. The workspace includes courts and halls, co-working space, meeting rooms, workshop and more. Hence Co-Work Space Booking Android Application delivers a fruitful solution for booking events. A flexible design of Android Co-Work Space Booking Application gives smoothie experience. A visitor can search office spaces for rental through easy search by city or category types, based on user query it will show the list of office spaces with office space name, image, service charge, the field of experience, contact information, the business timing of the company, etc. If interested, the user can make a deal with a proprietor via call either they might approve or deny the request based on the demand. Easy to manage the profile. In booking panel, the user can see the booking details with office space name, booking date, time and status of the booking. Once the space rental is available user can write a review and give ratings to the office space. The proprietor can manage their license information, edit his/her official details like experience area, office address, office phone number, business timings, service charge, etc. As well as the landlord will manage the booking request sent to him with name, contact number, date and time. In meantime, he/she can accept or reject the request accordingly. To handle a website admin dashboard has supreme honor, through on-demand home services android apps admin will manage rental platform. Admin controls like user management, co-workspace company management, location access, and category add or remove, managing appointments, ad service management and more. 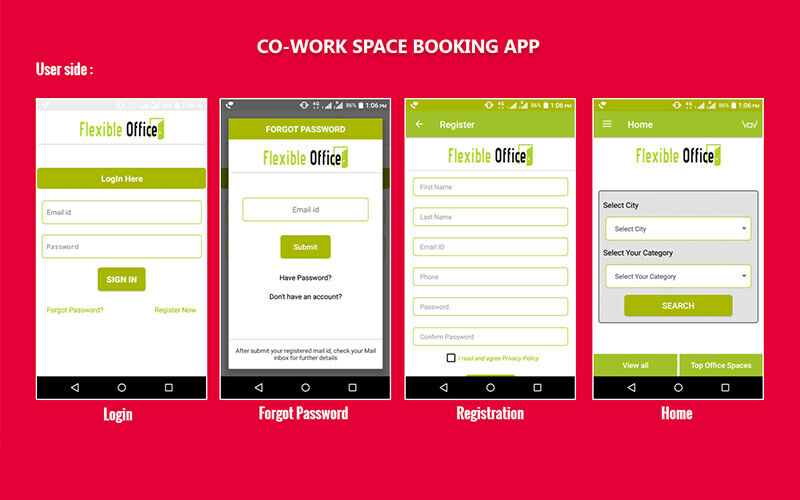 Co-working space booking app for Android simplifies all booking activities glibly. Through customization, you can set feature functionality as per the requirements, the features such as calendars, floor plan layouts, proposals, bills, worksheets, checklists, and notes etc. We know that website ranking is must to increase the lead generation, our flexible co-workspace android APK come with Android Java source code, web admin board (PHP & MySQL), database file, documentation etc. As pioneering in delivering android application solution across the globe, we stand upon of lakh of trusted clients. I have been right place of choosing of this script for rental workspace business, strongly I recommend this for all starters.